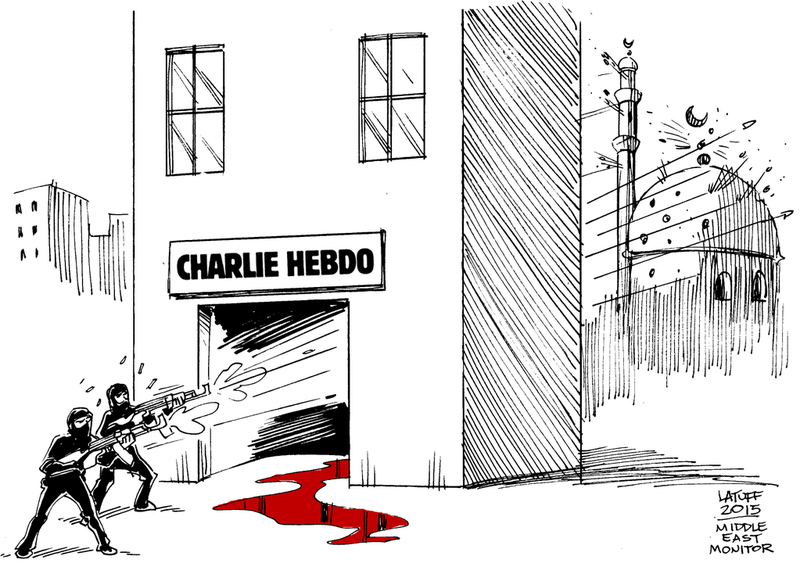 Carolos Latuff, one of hundreds of visual jounalists speaking into the horror of Paris. Every religion is dangerous. Like fire, wind and water, religion is a fundamental element of human life that can drown, blast and burn. Religion guides our fear and frames our shame. And it can also strengthen our capacity for the courage shown in generosity, compassion, kindness and decency. It can be a wicked brew and also be like warm French cider on a bitter Winter day. What are those of us who find our hopes in faith to do this week? What do we do when faith has been the language for nearly unspeakable acts? Do we just huddle behind the soldiers, or is there any place for our own actions to be as brave and relevant as the cartoonists like Carolos Latuff poking his pencil into the muzzle of terror? Can mercy be brave as violence? Although it filled up the CNN cash register this week, violence between religions is relatively rare and getting more unusual year by year. I’ve quoted the finding of Daniel Pink in earlier blogs, but worth remembering that all forms of violence continue to decline year over year over year. Most religious violence is between those who share a religion but find its variations deeply threatening. While dozens died in Paris because of their secular differences from Islam, hundreds, probably thousands of moderate Muslims died last week because their 1,500-year-version of Islam embodied the radical hospitality, kindness and sacrificial generosity that fills up the pages of Islamic sacred writings. This is true of every religion. John Calvin burned–literally set fire and watched die–Christian theologians that it would take another theologian to figure out the minor differences in doctrine they were arguing about. He killed Christians not Muslims. I’m a liberal protestant writer who not have survived a week in Geneva. I thought about this when worshipping down the hill from Calvin’s towering grey church with an ecumenical gaggle of english-speaking Christians last July. He would have locked the doors of the World Council of Churches, torched the whole place and everyone in it….and than sung a hymn about it. And Presbyterians are relatively nice people. I’m a Baptist…….which I’m just guessing is more common among the Klan than their up-market Christian cousins. It is always safer to have a radically different idea about god than a moderately different one using the same language. ISIS kills many more moderate Muslims more eagerly than Christians or those who believe in no god at all but humor. Every now and then they may travel to Paris for some especially flamboyant act of horror. But their every day killing is focused on the vast majority of fellow Muslims they find nearby who understand Islam as a faith of mercy and healing. Do something to strengthen the moderate Muslims, for whom this is a special time of danger, not only from their traditional nut-cases on the far boundaries of Islam, but now from those of other faiths, including secularity, that will fear anyone they think is a Muslim no matter where they’re from (including Sikhs who stupid Americans confuse with Muslims all the time because of their turbans)(Oh, good grief…..). 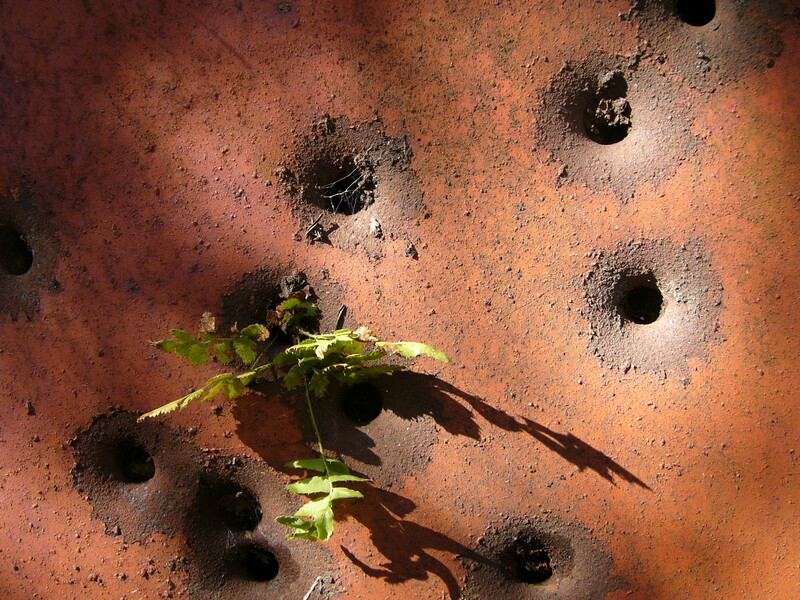 Sprouts find their way through the bullet holes in an old refrigerator in North Georgia. TC and I took a check over to our friends at the Muslim Free Clinic on Waughtown Street that I’ve mentioned in my blog before. They were today, as they do twice every month, caring for whoever walked in from the neighborhood that needed healthcare, medical counsel or a clue about where to their pill prescription renewed. It is very mundane, as most mercy tends to be. The physicians and volunteers show up and do it because their faith has thought them to do so. They aren’t aiming for martyrdom; just happy to settle for basic grown-up integrity. They are, as a Christian philosopher once said, “grabbing the near edge of a great problem and acting at some cost to themselves.” It is all a Christian, Muslim, Jew, Sikh, Bhuddist, Zoasterian or cartoonist can hope to do with their lives. Soak in the TV, then turn it off and go find someone who isn’t of your tribe, class, color, faith or opinion and be kind to them in some practical way. And the God known by every name any human has ever uttered in hope will heal your fears and count you among the living. This entry was posted in 100 million lives, AHRAP, boundary leaders, deeply woven roots, leading causes of life and tagged 100 million lives, Boundary Leaders, faithhealthnc, Leading Causes of Life, Stakeholder Health, Stakeholderhealth.org. Bookmark the permalink.